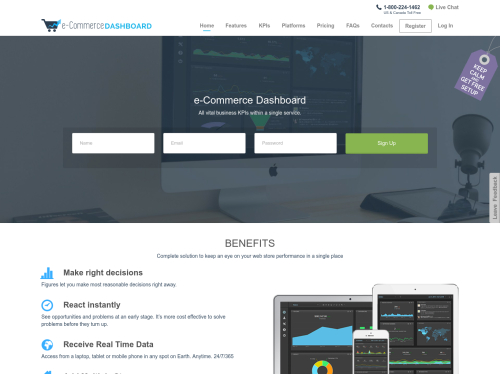 e-Commerce Dashboard is a business intelligence tool, encompassing all of the essential key performance indicators, delivered in an interactive and flexible format. It aims to accelerate and improve the decision making process as well as help companies identify market trends and spot problems that need to be addressed before they come up. e-Commerce Dashboard for offers: a set of specially developed eCommerce widgets; quick and easy integration with 25 platforms; real time data with 24/7 access from a laptop, tablet or mobile phone in any spot on Earth; professional support and free setup assistance.